Regardless of where you stand on the Edward Snowden issue – was he a traitor or a patriot? – I think he is running the risk of being labeled a major coward. Snowden was willing to divulge highly sensitive national security information to which he had access, in the belief that we Americans have the right to know everything that our government is doing. But, now he’s running from country to country so that he doesn’t have to face the consequences of his actions. If Snowden were truly the hero that some are making him out to be, then he should man up and defend himself in a court of law instead of hiding behind the Mommy-skirts of China, Russia, and Ecuador. Talking heads have claimed that Snowden was too low level to see many of the things he claims to have seen, although we all know just how much young geeks are capable of hacking. But, it doesn’t really matter whether he saw secret nuclear codes or his boss’s lunch order. The guy broke a contract with his employer. He broke the law by broadcasting to the world information that could put real flesh-and-blood people at real risk. He should stop hiding and have his day in court. I cannot tell a lie. No, I did not chop down a cherry tree; I planted one. 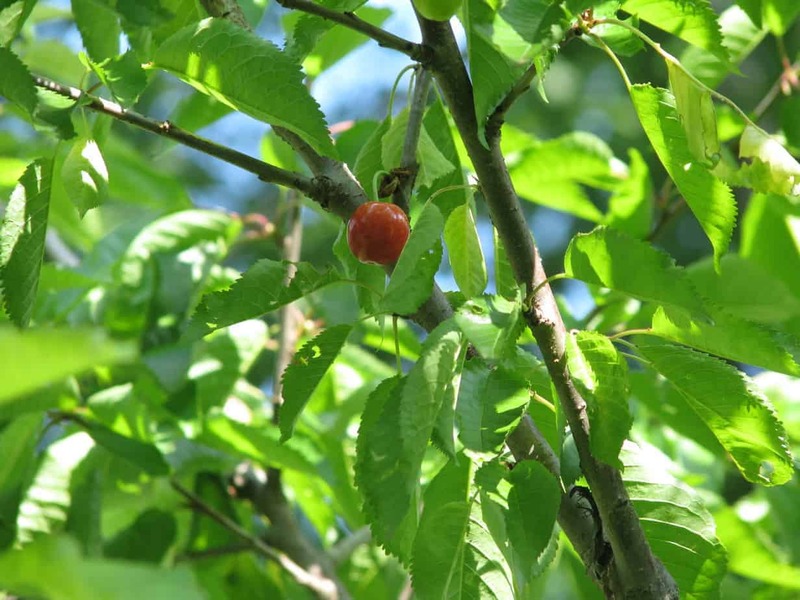 Four years ago I placed a tiny sapling in the backyard to replace our long-suffering crabapple, with the idea to provide not only beauty and shade, but something good to eat. The tree grew steadily every year but produced nothing, not even a flower. So, last year I called Gurney’s out of concern that we had a dud of a tree. The woman in customer service instructed me to be patient (not my strongest quality), and that on the fourth year fruit would come. She was right! Last week, while tending the garden, I walked over to the tree full of hope and expectation. There I found bunches of small, hard green fruits on several of the branches. Not a lot, but enough to get me excited. Then, three days ago I spied a single bright red globe hanging among the green leaves (see photo). That lone cherry dangled tantalizingly ten feet in the air. Now I know why those elevated work platforms telephone workers use are called cherry pickers. The tree has grown so tall in four short years that we will need a ladder to harvest the fruit. How would I get to that crimson beauty? I grabbed a rake and tried to pluck it. The tines were too widely spaced, so I found another one, with narrower tines. After about ten minutes I finally managed to knock that single cherry off the tree. A lot of work for one little cherry, but it was delicious. Not as richly colored as it appeared against the green leaves, but red nonetheless. In a few weeks we should have a full harvest unless the critters figure out a way to get under the netting.